Hello it’s Karen today with a card about getting out there and checking out a big city near you. That would be San Francisco for me. The City Adventures Digital Set is perfect for that, look at that bridge. You could use the images in this set for a card and for scrapbooking. The beauty is you can size them to fit your project and print or cut them out with an electronic die cutting machine. Here is what I did with some of the images. San Francisco is about 45 minutes away when the traffic is decent. Of course I have been there many times. I am lucky almost all the time we go we get nice weather instead of a foggy day. My husband works in San Francisco so he sees it every week day. To start off I did some ink blending on the background. That is after I adjusted the size of the bridge and printed it on the cardstock. I even looked up the hex code for the color of the Golden Gate. I don’t remember the code but the color is called international orange. I then sized the scooter and the car and printed those. I colored with Copics, a metallic pen in silver and a Pen-touch pen. On the windows of the car I used Nuvo Glaze. You can’t really see it on the scooter but I put a touch of Nuvo on the headlight. I hand cut the car and scooter. I put some foam tape under the car and the scooter when attaching them. As far as the car I had to have that VW on there and it had to be orange. My first car. I die cut a little bird and colored it gray with a Copic. I stamped the sun and since it was more of an outline sun I did some ink blending on it. Then there is the sentiment stamped with Versafine ink. The a2z scrapbooking store carries a wide variety of Hero Arts products as well as a nice selection of digital stamps! Get discounted new releases, sales, grab bags & more. Proceeds from our store benefit Celiac & Behcets disease foundations. Use my discount code Karen15 to get 15% off your purchase of $25 or more. If you’re looking for a Hero Arts product you don’t see in store, use the Request Custom Order button from with-in the shop. Categories: Handmade Cards, Hero Arts | Tags: die cutting, digital kit, Hero Arts City Adventures, ink blending, Karen | Permalink. I created a card using the open Tulip from the Hero Arts Digital Stamps Poetic Petals I printed it out on the larger size so to take up the front of my card. Since this month’s challenge is Color It. I figured I would show you the coloring. Usually, don’t. I started with the stem of the tulip. Colored it with shades of green. Next, I did the base of the tulip in shades of orange. Then, I blended some shades of yellows on the top of the tulip. Next, I fussy cut the tulip out and added some foam adhesive behind the tulip. I added it to a 4-1/4″ X 5-1/2″ piece of black cardstock. I then stamped my sentiment from Hero Arts CL498 Celebrate Stamp set with Versamark ink and heat embossed it with Gold powder. I Next, I added a few confetti sequins for finishing touch along with some metallic gold gel pen detailing in the center of the tulip. You can find me at Little Wings Create. Are you on social media? We are! Please join us on Twitter, Instagram and Facebook so you don’t miss any fun promotions or new challenge announcements! Please join us in this month’s “Color It In” challenge for your chance at a free digital stamp set AND, if you used Hero Arts or Sugartree Stamps, a $20 gift card to our etsy store. Our current monthly challenge can always be found in the menu bar and runs from the 1st to the last day of the month. The a2z scrapbooking store carries a wide variety of Hero Arts products as well as a nice selection of digital stamps! Get discounted new releases, sales, grab bags & more. Proceeds from our store benefit Celiac & Behcets disease foundations. Use my discount code Annie15 to get 15% off your purchase of $25 or more. If you’re looking for a Hero Arts product you don’t see in store, use the Request Custom Order button from with-in the shop. Categories: Handmade Cards | Permalink. Hi there! Its Gwendolyn and I’m here today to share a card I made to inspire you to join us in our latest challenge which is “Color It In”, so we would love to see any projects you made which you have coloured in and you can link them up here. I created my card using Hero Arts Spiral Petals stencil and Hero Arts Hummingbirds which you can get from the a2z Scrapbooking store. I wanted to create a form of a flower through my stencil so I added coloured paste through a part of the stencil, by first mixing blue liquid watercolour with a clear embossing paste, taping down the stencil on 250g mixed media card stock and adding the paste through the stencil with a spatula. Be sure to clean your stencil and spatula as soon as you finish. Once it dried, I sprinkled some Violet Brushos paint powder over it and spritz it with water, this dissolves the powders into beautiful washes of colour! While that was drying, I stamped one of the birds from the Hero Arts Hummingbirds set with Hero Arts black ink and coloured it in with my Zig clean color real watercolour brushes. I fussy cut it and added it on my card in a position that would give the impression it was suckling the nectar from the flower I created with my stencil. To finish, I stamped the sentiment from the Hero Arts Hummingbirds set, with Hero Arts black ink, using my Misti so I would get a strong black sentiment against the colourful background. Well, I hope you are inspired by my card to create a card of your own using your colouring mediums. I look forward to seeing them at the challenge here. 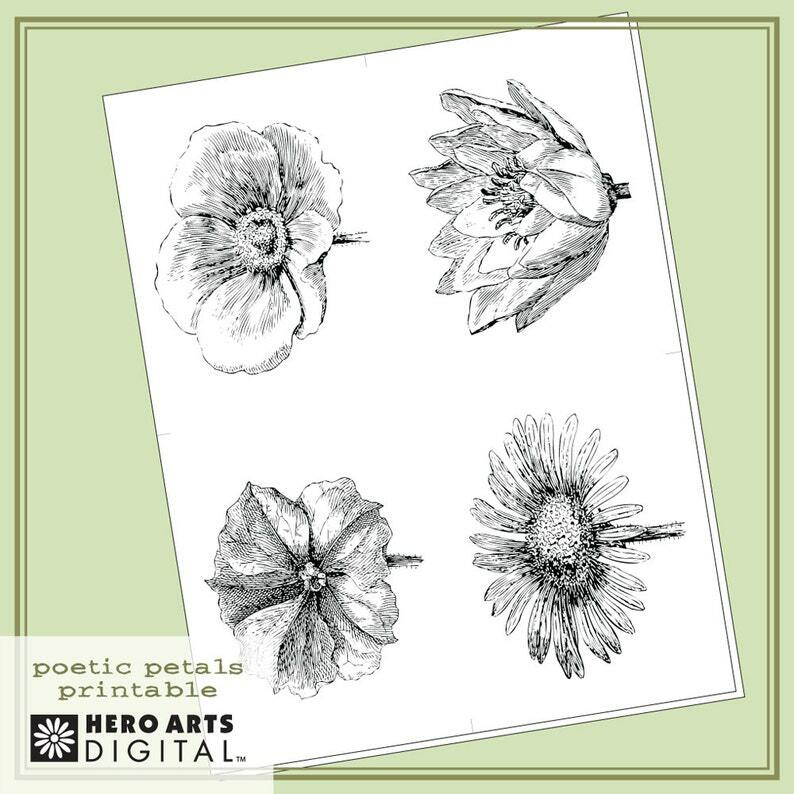 Who knows, you could be the winner of a digi stamp, and if you happen to use Sugartree or Hero Arts products, you will get a $20 gift voucher to shop at the store, in addition to the digi stamp! Are you on social media? We are! Please join us on Twitter, Instagram and Facebook? so you don’t miss any fun promotions or new challenge announcements! You can find me at desperatehousewifecraft. The a2z scrapbooking store carries a wide variety of Hero Arts products as well as a nice selection of digital stamps! Get discounted new releases, sales, grab bags & more. Proceeds from our store benefit Celiac & Behcets disease foundations. Use my discount code Gwendolyn15 to get 15% off your purchase of $25 or more. If you’re looking for a Hero Arts product you don’t see in store, use the Request Custom Order button from with-in the shop. Categories: Handmade Cards, Hero Arts | Permalink. Niki Garcia, one of our former design team members, is our Guest Designer today. To get to know her more, visit her at her blog: Stampin’HI. You could also catch her on Instagram. Now let’s see hear from Niki. Aloha friends! I’m dusting off the ol’ blog to be a guest designer for A2Z Scrapbooking…what an honor!! I’ve missed being on the design team and it was the best excuse to take a break from work and get crafty! This month’s challenge is Color It In so I decided to use the Hero Arts Color Layering Dragonfly on my card today. Oh wow, what a lovely card!! Thank you so very much for Guest Designing for us Niki!! Go to her blog post for more details. Categories: Coloring, Friendship Cards, Handmade Cards | Tags: a2z Scrapbooking, dragonfly, Flowers, Friendship Cards, Niki G. | Permalink. And our random prize winner for this challenge …. a big congrats to AJ! Hello! Today I have a fun little coffee card that I made using several Hero Arts sets. The main one is a digital image kit called Kitchen Silhouettes. I saw those coffee related images in that set and had to make a card with them. How about that old school coffee pot? The coffee pot and the cup – I took the coffee pot image and the cup image and used my Cameo Silhouette to size them and have just the outline so they could then be cut out with the Silhouette. I colored them with Copics. I stamped over the mug using the Hero Arts background stamp Lattice. On the coffee pot I used a white pen to make the dots. It is hard to see in the photo but I put clear glaze over the top of the pot to make it look like a glass top. For the steam I used a die from a Hero Arts monthly kit to cut that out of watercolor paper. The coffee beans were printed from a Hero Arts digital kit Caffeine Fix. I resized them, colored with Copics and hand cut them out. The sentiment is from the same Hero Arts monthly kit. The background I made by dropping Hero Arts liquid watercolor on a fairly wet piece of watercolor paper. It kind of has that oops I spilled the coffee look. Categories: Coloring, Handmade Cards, Hero Arts, Watercolor | Tags: Copic Coloring, die cutting, digital kit, Karen, kitchen silhouettes, liquid watercolors | Permalink. I have loved the 2018 Christmas selection of stamps and I had to use the gingerbread house in a non-traditional way. Gingerbread is not only for Christmas. I know it seems as though everything is floasting, but they somehow float together in harmony. Well, that’s the way I see it. And I have to ask you, if I hadn’t come right out and told you the house was a gingerbread house, would you have suspected immediately and exclaimed, “OH MY, It’s a Gingerbread House”? Categories: Coloring, Digital, Handmade Cards | Tags: 2019, Arlene, Copic Coloring, die cutting, Digital, digital kit, Hero Arts, stamping | Permalink.